Kat models her recycled paper necklace. No, she doesn’t have a face. 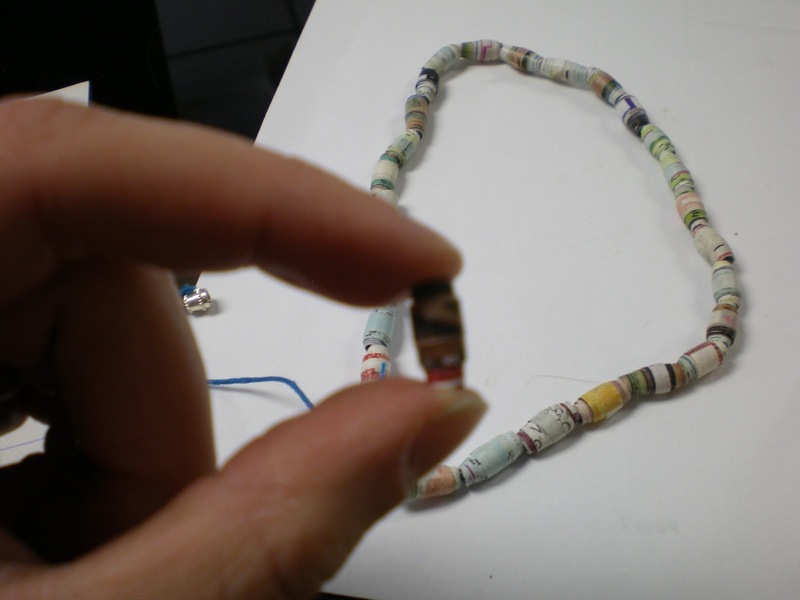 Next up in our Jewelry Club tutorial series… Recycled Paper Beads!!! Recycled paper beads are super easy to make, and I think they look really cool. You can use the beads to string a necklace (like I did for my own accessorizing) or a bracelet (like we did in Jewelry Club, due to time constraints). That’s the thing with beads; they’re very versatile. Using a paper cutter (or scissors, but a cutter is much easier), cut your chosen pages into very long (the length of the longer side of the page) triangles. I tried to keep the width of the triangle at around 1/4″, but the size is up to you; the size of the wide edge of the triangle is the size of the bead. 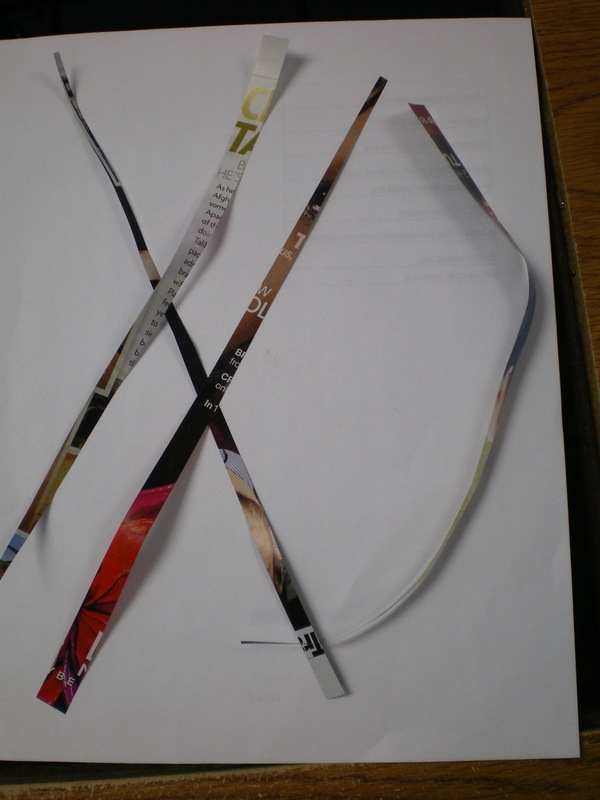 Paper strips to start out with. Roll the paper tightly around itself, trying to keep the paper as centered on itself as possible (which makes the bead even). Once you have about 1/4″ of paper left unrolled, add a dab of glue (white glue and glue sticks both work well), and continue to roll. Sometimes you have to try the glue a couple times (especially if the paper is very glossy), and you may get sticky fingers, but this will secure your bead. 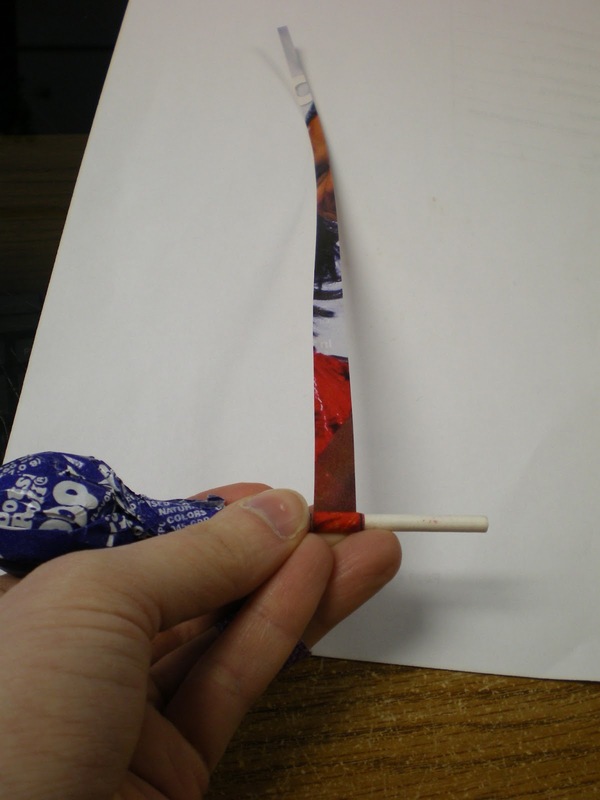 Pro-tip: Don’t eat the lollipop until after you’re done making beads, or things can get rather sticky. 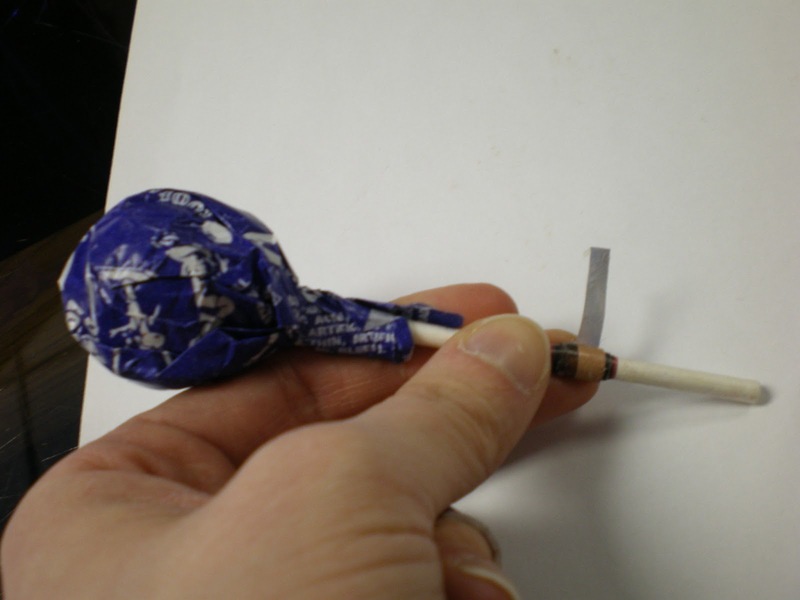 Gently pull the glued-shut bead off the lollipop stick. It should slide right off the end. And now you have beads! I used mine with hemp string and a regular old jewelry clasp to make a necklace, but whatever your preferred method of beading is should work. Just a warning: these beads are not waterproof, so make sure you don’t forget and wear your necklace in the shower, or at the beach! You can make the beads waterproof by using Mod-Podge or clear varnish, but this takes a long time to dry and can get very messy, so we didn’t do that. This just wraps up the Jewelry Club projects that we’ve made so far, but be sure to check back in March to see the instructions for the next project! 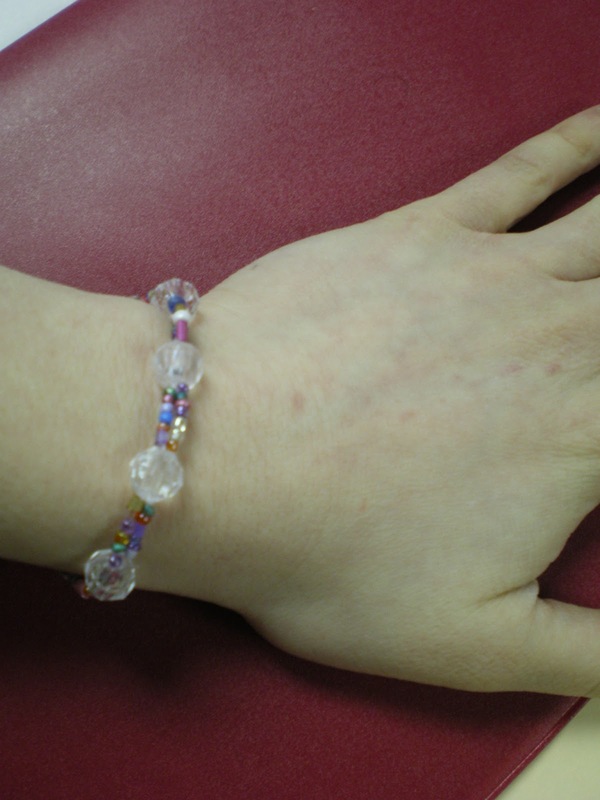 Next up in our overview of Jewelry Club projects: beaded bracelets! Double-strand beaded bracelets, to be exact. What makes them a double-strand? 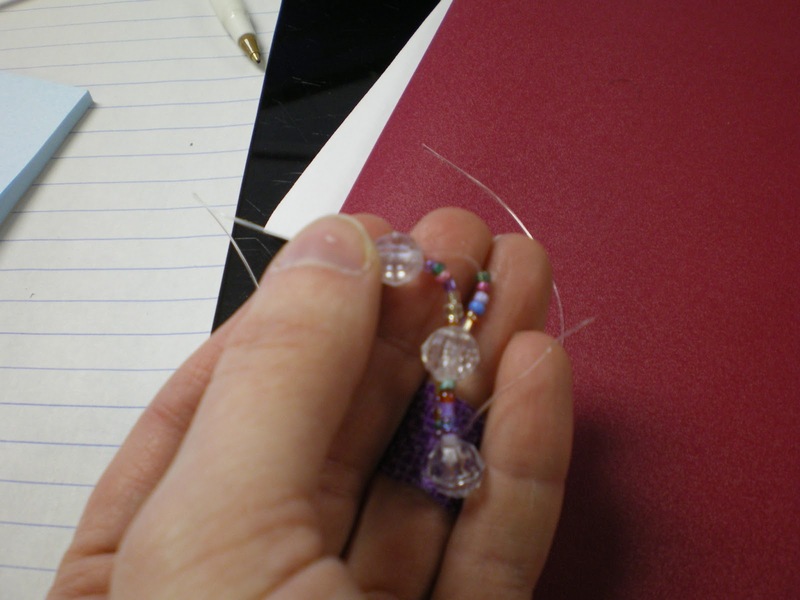 As you can see here, there are two strands of little beads (seed beads), connected by larger beads. I found the idea for these in a book, where they were called “kandi bracelets,” but looking up that phrase online tells you that kandi bracelets are beaded bracelets that you make and trade with your friends, and don’t have to be this specific kind of bracelet, so here are the instructions to make the ones we made in Jewelry Club. That looks very long, but it fit me perfectly. When you have your bracelet the right size, thread your jewelry cord back through the first bead (the anchor bead). It should make a completely closed circle. Make sure it fits before moving on to the next step! Big beads are shared by both strands of little beads, because sharing is caring. I love the purple band-aid, don’t you? Don’t worry; it was just a paper cut. Once you’ve gotten all the way around the bracelet, thread your cord through the anchor bead one more time and tie it off as tightly as you can. And you’re done! 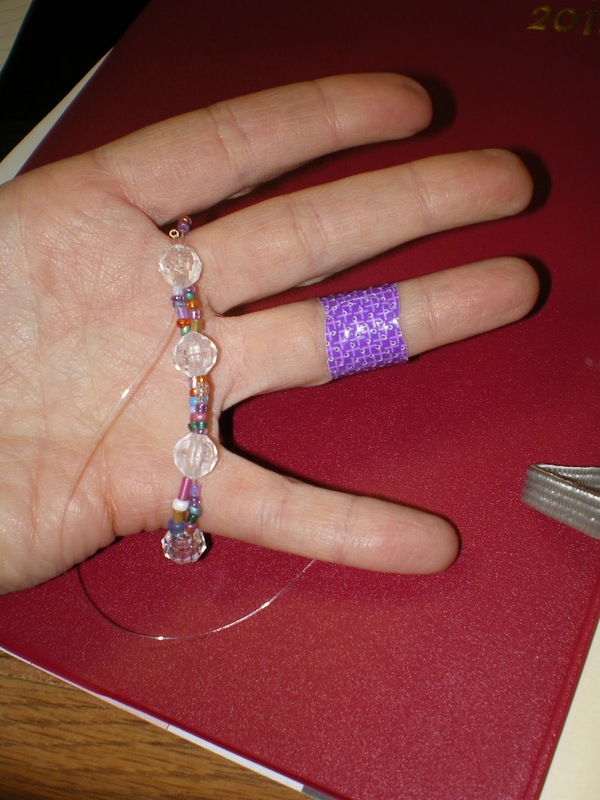 We’ve been having a lot of fun with Jewelry Club here at the library, and we’ve already made 3 awesome projects. The problem is, not everybody can come to every club, and sometimes you just can’t remember how it was that you made that bracelet. To remedy this, I’ve decided that we’re going to post instructions on the blog, with step-by-step photos of how to make each of the projects we’re working on. 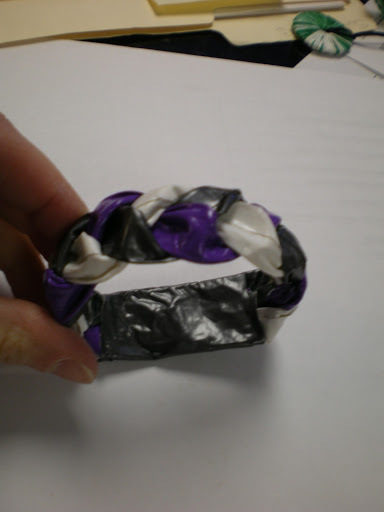 First up: Duct Tape Bracelets! This is a really easy, fun project, and the one that I get the most questions about. That’s probably because, while it’s very easy, there are several steps to it. 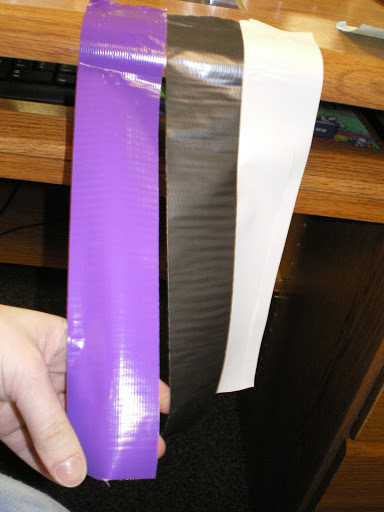 To start with, you need duct tape, which now comes in a plethora of colors and designs. You can use one color or multiple ones; for this tutorial, I used 3 colors, just to make it easier to see what I was doing. Once you choose your colors, you want to cut off a strip that’s about 8 inches long from each color (you need three strips total). 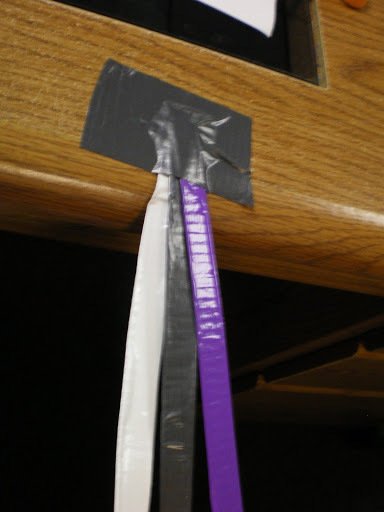 Here, we have my strips, hanging off the edge of my desk. Lovely! 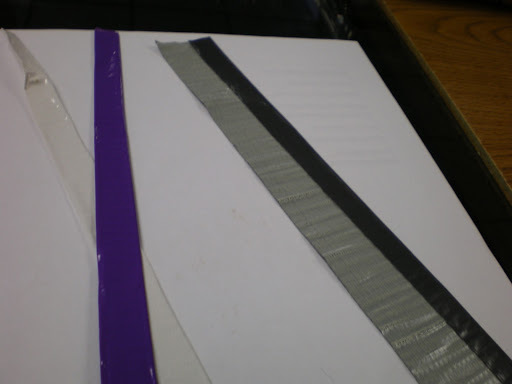 After you have all your tape strips ready, place them (one at a time) sticky-side up on your work surface, and fold over about 1/3 of the strip horizontally – I find it easiest to start sticking it down in the middle, which keeps it mostly even without giving you wrinkles. 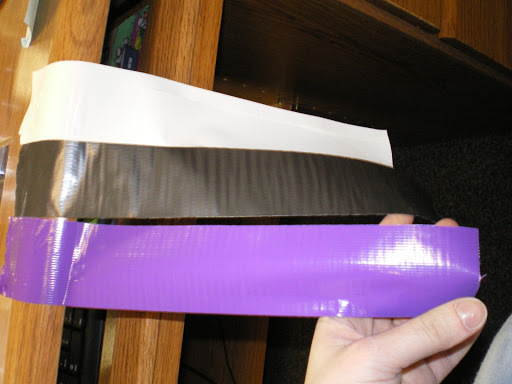 Fold each strip over onto itself, so that it makes one solid 8-inch-long strip of tape that is no longer sticky. Don’t worry if it’s not perfect – mine here weren’t even in width all the way down, and the white one had a huge crease in it, but you can’t tell in the finished bracelet. 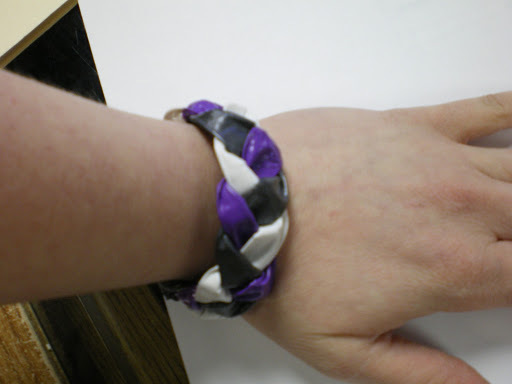 Now that you have 3 tape pieces, take another piece of duct tape, about 3 inches long – whichever color you want to be the bottom of the bracelet – and tape all your tape strips to the table, and we can start braiding! I personally like the Top-Side Method, because I liked that it gave texture to the bracelet, and it also curved inward a little bit as I braided, which made wrapping it around my wrist a lot easier. Yes, it looks a little lumpy as you’re braiding, but the finished result is what you’re going for. It’s a personal preference thing. I think the girls at Jewelry Club liked the Folding Method better. 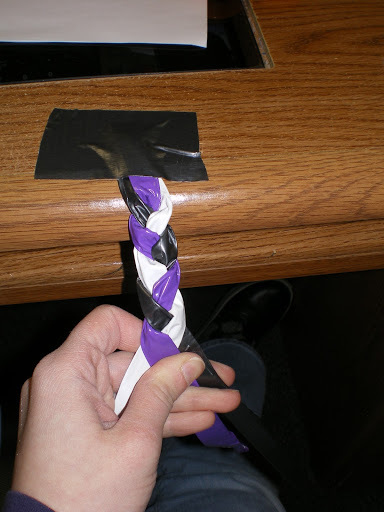 Once you have braided your tape – as tightly as you can! – it’s time for the tricky part. 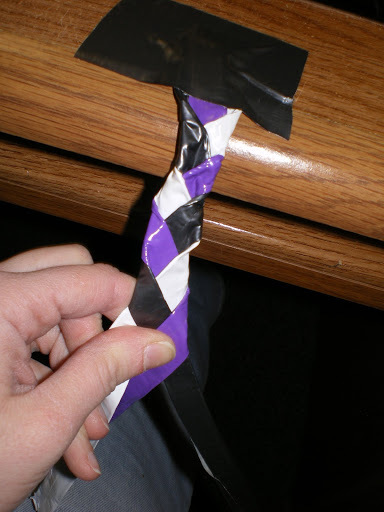 It’s easier if you have a second set of hands to help with this: Take the entire braid and the tape off the table, being careful not to unstick it from the tape that was stuck to the table. Then, wrap the braid around your wrist to make sure it fits, and tape it together to make it the size you want it, using the tape that you had used to secure the braid to the table in the first place. Confusing? Here is me holding the bracelet together with my thumb to the correct size (it’s difficult to tape it together when it’s on your own wrist, or even on somebody else’s wrist – you may have to make sure it’s the right size and then tape it in the open air). I then took that tape and wrapped it around both ends of the braid to secure it into a loop. 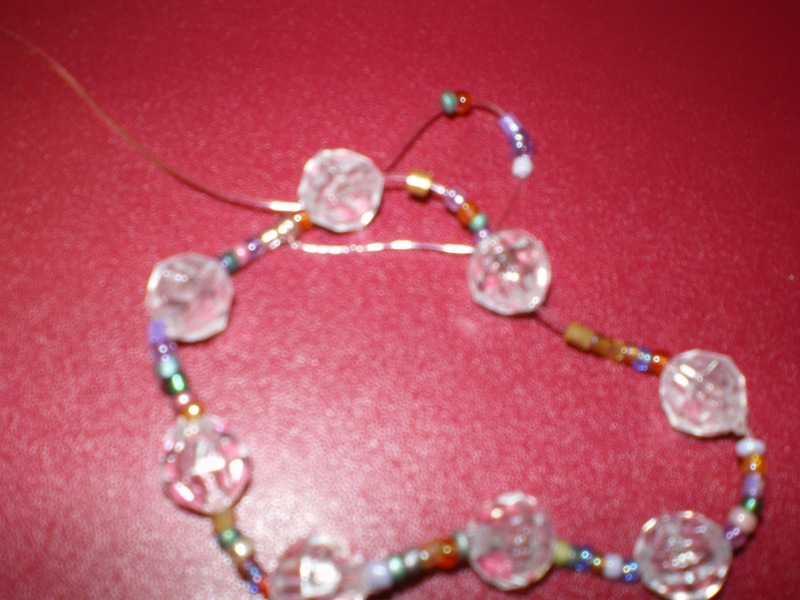 The braid is now a bracelet, with a bottom part where the two ends are held together. It looks a lot more complicated than it is; the girls at Jewelry Club each made 4-5 bracelets in the hour that we were there, including the time for instruction and the time to pick out tape colors. 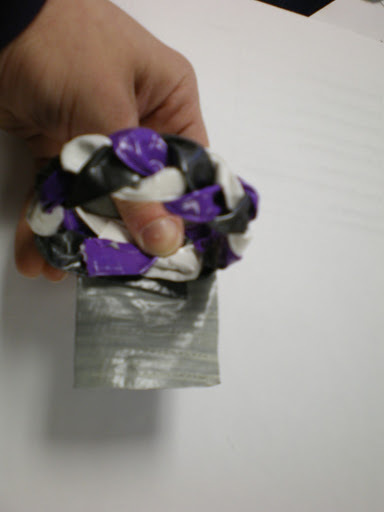 If you’re interested in making bracelets or other projects with duct tape, be sure to check out the Duck Tape brand’s Ducktivities website at http://duckbrand.com/duck-tape-club/ducktivities for lots of ideas! I’ll write more about Jewelry Club soon. I still have a few projects yet to teach you! This is possibly my favorite photo ever. 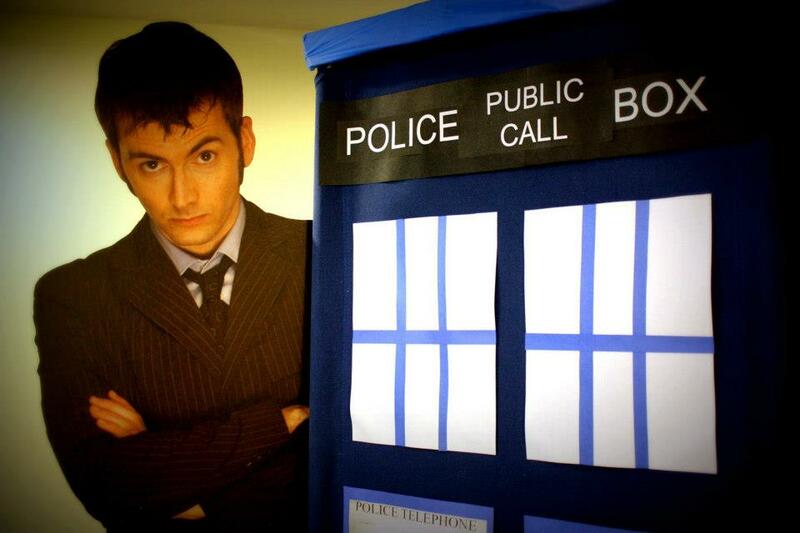 David Tennant is cardboard, and the TARDIS is the one I made. Of course, we would watch episodes of the TV show; we decided on episodes from the new run of the show rather than classic Doctor Who, because that’s what most people are watching, and I asked opinions from many various people about which episodes they thought we should watch. We ended up with 5 episodes with both the 10th and 11th Doctors. 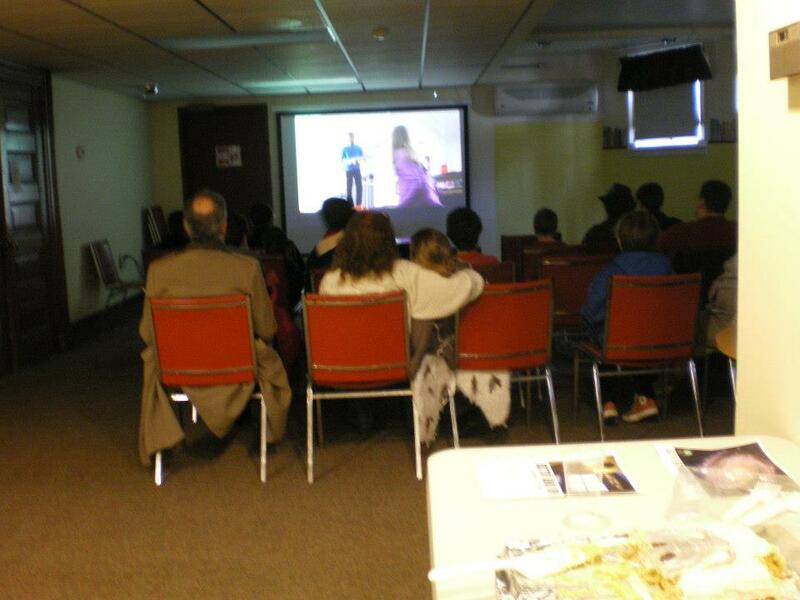 We had a little extra time at the end, so I had the crowd pick another episode to watch, too. Watching your favorite show is more fun when everyone else is into it, too. Besides the show, which was on all day, we had a trivia contest (with questions culled from various Doctor Who quizzes I found online, which were checked by the fan who wanted Doctor Who Day in the first place). I had intended to assign point values to the questions and tally up a winner that way, but we had so many people involved that we did it “Spelling Bee Style,” where if you got an answer wrong, you sat down, and if you got it right, you’d go to the back of the line. It was a heated contest, and the winner was excited to get his prize – a wind-up Dalek that patrolled around the tabletop. Oh, yes! There was also the TARDIS. This was made (with help by Sophie, who also loaned us her cardboard David Tennant) out a folding partition, some construction paper and printer paper, a pizza box, a plastic blue tablecloth, and a jam jar taped to the top of a light for the light on top. 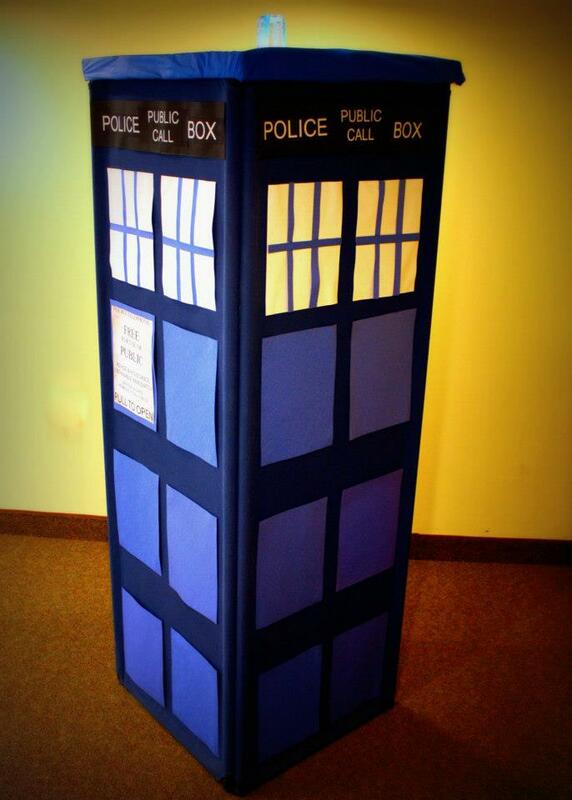 We put this in front of the door, so you had to go through the TARDIS into the meeting room, so it was bigger on the inside. 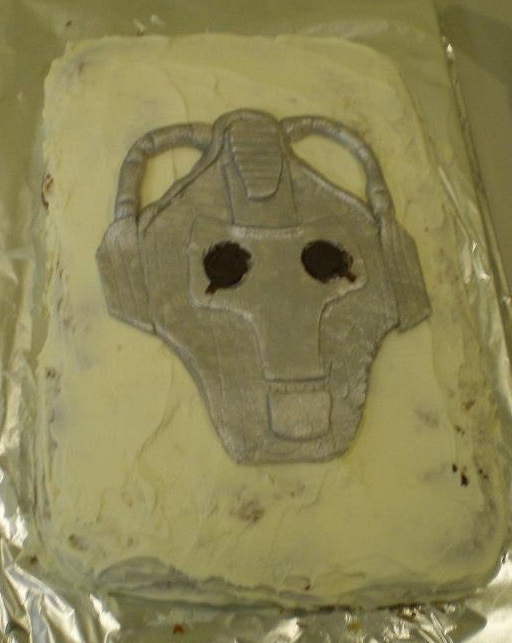 There was also a Cyberman cake, baked and decorated by yours truly, which was completely gone by noon. Not a tenth as scary as an actual cyberman. I would like to say this looked better in person, but… it tasted good. We also went through 9 bags of microwave popcorn and about 6 pitchers of lemonade. I had not been expecting 40 people in my wildest dreams, so I was unprepared for how much food we needed, but I won’t underestimate again. We have now had requests for other theme days, and we’re hoping to hold one a month until people stop showing up. The next day scheduled is Firefly Day (the space-western Joss Whedon series, not the bug), which will be on March 9. Sci-Fi Saturday is penciled in for May 4. Others TBD, but they will come. So, tell us – what other theme days would you like to see?